Me too. I know a few Ppl waiting for it. Already asked this question in the Transhuman General Discussion thread, to no avail. Also, I'm curious if the hardback version will include all the 'unofficial' errata from the Errata thread, or is it going to be *vanilla*. So Posthuman keeps their cards really close. They are very careful about only pushing out dates when they know for sure that they will be fulfilled. My guess is that the exact date is still a little up in the air. They probably know an approximate date, but little else. And I think it is safe to assume that the book will not have any of the errata from the GD thread. The books have already been printed. They were printed quite a while ago, I think (~a month?). My guess is that they are still ramping down from Gencon. Hoping to use the great-looking material from the new book very shortly; loved the fiction, gave it a five-star rating and a sweet review on rpgnow. Glad to support Posthuman and glad to stay up-to-date on a truly great game system. There's been no sign of the book in my FLGS. Has it been and gone? We'll make an announcement about the Transhuman street date when we have it finalized. The Kickstarter backers get their copies shipped before we are shipping copies to distributors/game stores/amazon/etc. There's been a hold up with shipping the Kickstarter backers their copies because our warehouse is so busy with *other* projects that are in the queue ahead of us. The last update I saw was that it was going to start shipping to the kickstarter folks the week of sept 30th. It is now the week of Oct 14th and there has been no updates on kick starter page or here and it does not appear that anybody is reporting having received their hard back yet. Can we get an update how the shipping is going or if it is going I don't mind delays but silence is concerning. I just got an update from Kickstarter that the books are shipping this week. looks great. love the book, the lifepath character generation is maybe the best/most fun character creation process i've yet encountered. Started a session with a bunch of new players when the pdf came out, they all got super invested/interested in the setting right away due to the incredibly immersive backstories that it generates. Super stoked to have the hardback! excellent work as always. so did you get any tracking email or message to show your individual one shipped out or just the blanket kick starter update everybody got. I am just curious if mine has shipped yet or if it is just stealthily making its way to me. I didn't see any notification. It just showed up. excellent that means mine is probably lurking my way as we speak good good. Ironically mine arrived about 15 minutes after I posted that. Lurking indeed. I was messing around with the lifepath character generation and you are right it is pretty darn good especially for people who really don't have a solid feel of exactly what they want. One question I had at this point I did not see clarified in the book though is I now have in theory two starting morphs I would just run under the assumption I was born a neo pig and got a slyph morph after being adopted by a hyper elite so I fit into society better. From there my youth event was skipped to much school hehe uh oh. HAHAH okay so I am a neo pig space pirate techie hurm oh god haaha my character now has a name. Ham Solo. I got an extra moxie from my event surviving the fall and a gold star trait from firewall for my assistance to them. Overall it actually makes for a pretty coherant character and shows one important thing in life. Stay in school or you will turn into a space hacker/assassin/pirate. I have not finished cleaning up all the stats and buying the gear but from eyeballing what I had it actually looks like a pretty good balanced character. The 1pp assassin package and the 3 point pirate package combine out to pretty reasonable starting combat/frey/ranged weapon abilities and techie combined with hacker and pirate combine to give me pretty damn good tech background with a focus on space ships. It is pretty easy to see with that kind of background why he could be a good firewall asset good networking/reasonable combat abilities/good tech abilities in a profession that tends to visit the seedier parts of the solar system. As far as I am aware, it isn't publicly available yet. The copies that are going out at the moment are those purchased during the kickstarter. 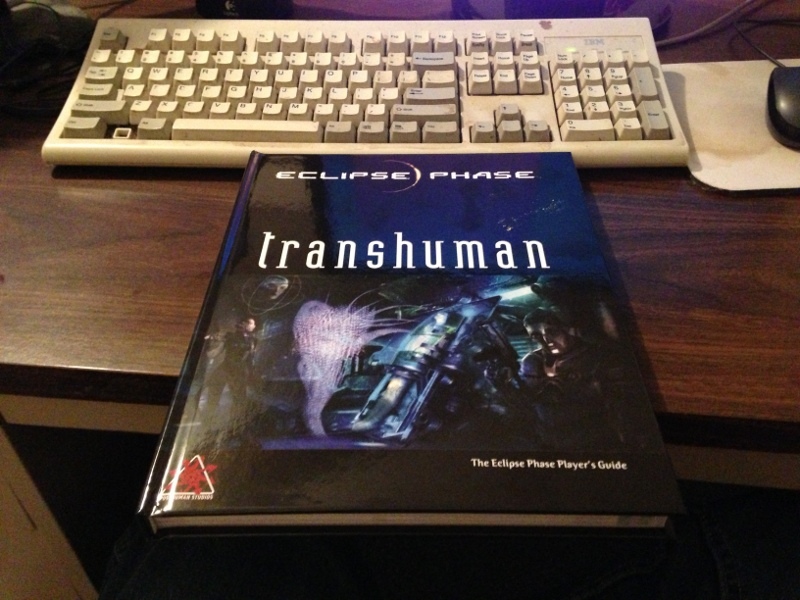 Transhuman has not been released to game stores and distributors yet. When we have a street date for it, we'll be announcing that! I still haven't received my hardcover of Transhuman yet - I was a backer here on the website. Any word on when the website backer books are going out? Amazon has jumped the gun on making Transhuman available. I would ask that you not buy it from them. Any chance of a rough street date for Transhuman for us folks who aren't kickstarter backers please Adam? I'll take that as a "no" then shall I? Buy from Amazon if you like, in my opinion. "Also: We are not going to ship any copies of Transhuman to game stores and distributors until all of the backer copies ship (Not counting the stores that backed the project at the Vendor level)." So if it is shipped to stores, go ahead. We'll be announcing the actual Transhuman street date this week. Sorry for the late reply; my email client has started oddly filtering emails from our message boards and my efforts to re-train it are not yet successful. Muses, man. I was just wondering if you really do read and when necessary reply to e-mail sent to kickstarter |a| posthumanstudios |dot| com? The first e-mail I sent 2013-08-04 asking if I could upgrade the Singularity add-on to a group license (allowing my players to use it too). I did not get a reply, which is ok, as the question was not important for me. The second e-mail I sent 2014-03-17, just over two weeks ago. I was asking a more important question about the Transhuman kickstarter shipping which I had returned to sender due to a screw-up by the Swedish postal office. As I didn't get a reply on the first e-mail, I now suspect I wont get any on the second either. This one is a bit more important to me, as it involves shipment of the Transhuman book and Kickstarter extras (I might be wrong here, as I don't recall if any of the extras was ready when it was originally sent). I don't use the e-mail address I registered here with, but I don't think that should matter as it is the one I payed for the Kickstarter with. Buio -- I'm sorry that I didn't get back to you on the re-shipping issue. I have some related stuff in the queue and I'm going to get that done this week.